Glad to hear this is coming around again. I can probably pull my nose of the Italians to read something for this cherished event. I hope there will be an accompanying culinary event; the cerveza and tacos in your photo are making me hungry. Scott, delighted to have you join us again. While "an accompanying culinary event" is a swell idea, please note that the header photo would be much more mouthwatering if those were California tacos rather than Massachusetts tacos sitting alongside the cerveza. Accept no substitutes! Better get reading soon, I have slowed to a crawl. I will certainly join in though, with Dublinesque and perhaps another. My Spanish shelves are pretty full of invitingly unread books. Séamus, maybe we can try and break out of our reading slumps together! In the meantime, that Vila-Matas title sounds like a perfectly chosen book for an Irishman's contribution to Spanish Lit Month...although I wouldn't mind seeing you break down another Onetti novel either (a fine Vapour Trails tradition in my book). Cheers! An amazing photo. I hope to read the big one soon. Thanks, Stuart. I hope to reread the big one soon! Hurrah for you, Jacqui--I'm not sure you realize how instrumental you were in drumming up enthusiasm for Spanish Lit Month 2015, but you were! Look forward to seeing what you thought of All Souls, of course, and it'd be great if you could join the gang for the Bioy Casares group read or write about Spanish wines (I've been enjoying a glass of Tempranillo here and there of late myself). Cheers! Delighted to have played a part in getting the show on the road this year, looking forward to immensely. Enjoy that Tempranillo! Thanks, will do...esp. now that I have your approval! 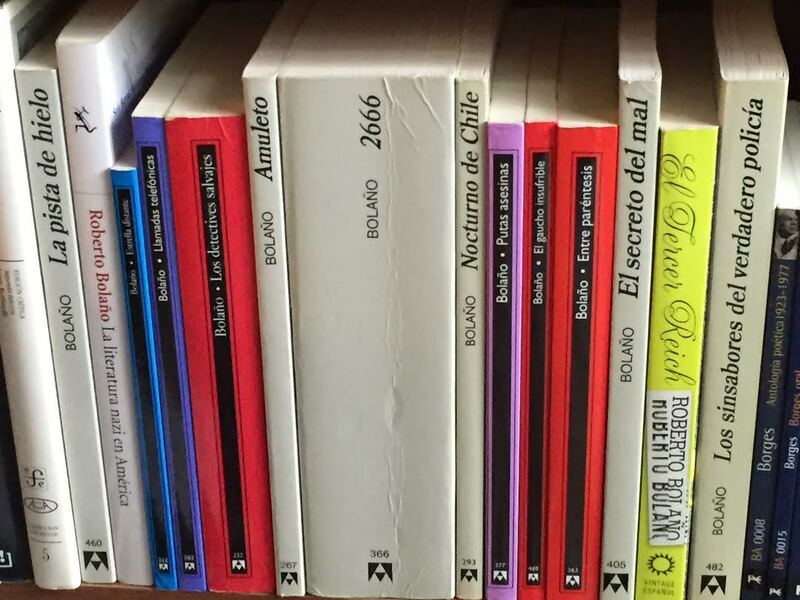 Yes, the Argentinean Literature of Doom will definitely take place later in the year whether anybody else wants it back or not--glad to hear of your interest this far ahead, though! I'll add your link to next Sunday's list, Jacqui, but thanks for the notification. Expect there will be another couple of diehards for the Argentinean Literature of Doom later in the year as well. Cheers! I'm in, too. Let's see what Spanish language lit I can find in India before I go off to Bangladesh. :) There's a few authors I've been meaning to read. Chelsea, delighted to have you join us! I believe you're the first "first-timer" to commit to Spanish Lit Month this year, so I'm sure all the regulars will be as excited as I am to see what surprise(s) you have in store for us selection-wise. Thanks and hope you have fun! It's that time of year again! What to read ... what to read ... I own several translated works from Spanish published locally but they are all quite thick. Perhaps I'll buy a new book I can manage to finish in a month. Spanish Lit Month is a good excuse as any to buy new books. Always appreciate your enthusiasm and smarts, Rise, so I'm happy to hear that SLM 2015 may help smash down the doors of any restrictive book-buying prohibitions you were observing. Perhaps you should buy two books--one for next month and one for the Argentinean Literature of Doom which, after all, isn't too many months down the road! Looking forward to your picks as always, my friend. No promises yet but many good intentions. I've got Dublinesque as well and short story collections and . . . many possibilities. No pressure, Caroline, but I'm sure you know that it's always a delight to have you join us. And while you seem to have plenty of possibilities already, I'd like to encourage you to read a Catalan work this year if you're still interested in something along those lines. I might do the same myself. Cheers! I'm going to join in and read all my most obscure Spanish books. There's still a few I'm "reading", I notice, from last year's challenge. Also, I just started Morel a few weeks ago, so perhaps will finish it by the end of next month. Obooki, awesome--the more obscure, the better (that will counteract anybody who wants to slip in an Isabel Allende novel or something along those lines! ), and maybe it's just meant to be if we all finally finish Morel at more or less the same time. Many of my likely choices are leftovers from last year as well, by the way. I was really happy to hear you and Stu are hosting this again this year! I've decided I'll read from my shelves this year--which actually doesn't leave me too many choices that aren't rereads. I'm thinking Love in the Time of Cholera, and maybe something else if I have time. This should be fun! Amanda, awesome! Always happy to do reading projects with you, and I look forward to seeing what you make of that García Márquez title when the time comes. ¡Saludos! My various vacations, just completed and still to come, make this year's event a bad fit for me. I will have to find something short. A Lope de Vega play. C. Aira is always a possibility. Tom, thanks so much for making time for SLM in between your summer vacations. If you'd like company for Lope de Vega or any of his Siglo de Oro playwright peers, feel free to "challenge" me Scottish Rules-style! Going by the "what is in the house" standard, the Lope de Vega play will be "Fuente Ovejuna," a good one. I'll write about it in a couple of weeks (week of 6th-10th) because that will be the end of July blogging for me. Great pick and one I'll be happy to read with you seeing as how I've almost bought it several times. My book buying "standards" for SLM appear to be a little more profligate than yours, but perhaps that's one of the reasons you're going on vacation in July and I'm not! I have read two or three more - not all 500 plays or whatever the real number is - but they must have been from the library. I do, though, have a copy of La Dorotea in translation. That is on the profligate side. La Dorotea is definitely something of an extravagance, yes. Although my library has all the Lope de Vega titles you could possibly want often in handsome deluxe editions, I'm a sucker for the critical editions put out by Spanish publishers Cátedra and will prob. throw my $$$ down the drain accordingly. Happy to be reading this one with you, though. 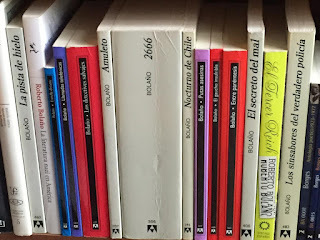 It feels that I've been absent from the blogging world so long with this dreadful surgery and subsequent pain I've enjoyed all June, but I'm so glad to slowly resurface and see the arrival of Spanish Lit Month 2015. I've been keeping my eye out for authors I wish to read and hope to post my thoughts soon. (I have a few rather strange looking books from Cuba which seem intriguing, if not cutting edge, or I could always finish 2666, right? ;) At any rate, please count me in. Bellezza, sorry to hear that you've been waylaid with health issues so far into June but delighted to hear that SLM 2015 factors into your recovery plans! Hope you feel better soon and thank you for reading along with us whatever you choose to read. Cheers! Hope to put away copious bottles of Albarino whilst reading as well. Jody, glad to hear that and nice going on your selections! If you have a blog or a site you'd like me to link to, please let me know via comments or e-mail (available at my profile toward the upper right of the page). Happy reading (and imbibing)! This is a good occasion to re-read ABC's A Plan for Escape - because someone has to stand up for his real masterpiece! Morel shmorel! Miguel, glad to have your The Invention of Morel-ridiculing self with us! Bioy, am I excited for your review!!! I'll join you with Tarzan's tonsillitis by Alfredo Bryce-Echenique. Emma, wonderful, merci! I'm thinking of reading a Bryce Echenique short story or two after thoroughly enjoying his novel Un mundo para Julius last year. Aussitôt dit, aussitôt fait, as they say in children books. Will be by to check out your post soon (I know nothing about the title, so I'm kind of glad you picked it for that reason alone)! Mee, delighted you can join us! I've been putting off reading The Invention of Morel for years and years, so I agree that it's "great timing" to have so many readers wanting to read this South American classic at the same time. Cheers! Thanks for getting in touch, Pat--have added your blog to the master list and will check out your older reviews later. To participate for Spanish Lit Month, though, all you have to do is read and review a Spanish-language work during the month of July and then let me or Stu know about it. I'll be collating July reviews on Sundays throughout the rest of the month. Cheers! Thanks, Pat--will add your review to next week's link round-up on Sunday. Thanks so much for reading along with us! Hi, here's my second contribution to the event. Days of Combat by Paco Ignacio Taibo II. Belated thanks for the notification, Emma, and sorry I'm so late in acknowledging that. Cheers! I published my announcement post last Saturday. Very late, I know, but I've just found out about this event, and couldn't resist joining in! Anyway, I have chosen "La Isla de los Amores Infinitos", which I will be reading in translation. I am fluent in Spanish, but, in the interests of posting Goodreads information about the book, decided to read the translation instead of the original. The title in English is "The Island of Eternal Love", and the author is Cuban writer Daina Chaviano. This novel caught my eye because it's in the tradition of magic realism, which is a genre I love. Besides, I can personally relate to the central character, since I'm originally from Cuba myself. I've already covered several chapters of the book and it is definitely a fascinating read. I hope to have my review up by next Thursday or Friday. Belated thanks for your comment, Maria, and apologies for the delay in responding but I forgetfully thought that I had already done that! It's always great to run into other Spanish speakers via the blog, by the way; I only hope you'll be able to understand mine on my Spanish-only posts because what I know of the language was almost entirely learned in school and is thus not all that impressive. ¡Saludos! Thanks, Pat--will be by to check your new review in the next day or two!